2013’s Man of Steel takes quite a different approach to the Superman story than 1978’s well known Superman: The Movie. The latter film is largely optimistic in tone, lighthearted, and includes touches of humor. Indeed, when John Williams scored the film, he remarked that one of the things he liked about it was that “it was fun and didn’t take itself too seriously.” Williams’ vibrant score certainly reflects this element of fun while also capturing the film’s optimism in grand heroic fashion. Man of Steel, on the other hand, deals more with the philosophical questions of being an outsider. Desperately wanting to fit in with the rest of society, Superman is continually faced with a dilemma: if he reveals his powers to the people of the world, then he’ll no longer be considered one of them. But if he is to retain his “fit” with society, then he can no longer rescue anyone with the help of his powers. This different kind of Superman film calls for a different kind of Superman score, and that is exactly what Hans Zimmer provides. Although Zimmer’s score does not make use of strict leitmotifs, which correlate a short snippet of melody with a certain character, place, object, and the like, it does exhibit a loose coordination between certain themes and situations involving certain characters. For this reason, it can be difficult to put a label on Zimmer’s themes and they must often be given a more descriptive title than simply the name of a character or place in the film. Another feature of this particular score is the way in which many of its themes are given dual meanings that are either opposites or complements of one another. Below is a film music analysis that examines these aspects of several themes in the film. In addition to Jor-El/Kal-El, Superman has two other themes that are essentially different forms of the same theme, hence forming another of the score’s dualities. One of these generally accompanies Superman in positive situations in which he is overcoming some sort of obstacle, either internally as he struggles to fit in with humanity, or externally in his battles with General Zod. For this reason, I call it Superman Heroic. This theme opens the film proper as the baby Kal-El (Superman) is being born. Though Kal-El is not performing any heroics at this particular moment, the music acts something like a prophesy: one day, this child will accomplish great things. Other instances of this theme can function in a similar way, as when Kal-El gets his first glimpse of his iconic outfit, given to him by Jor-El. Kal-El’s donning of the suit takes him a big step further towards “an ideal to strive towards” that Jor-El believes he can become for the people of Earth. At other times, it functions more as a theme to signify a victory for Superman over his own internal struggles. Examples include Superman’s voluntary surrender to the military (symbolically restrained in handcuffs that he could, and later does, easily snap in two), and his being hired at the Daily Planet as Clark Kent at the end of the film. In both cases, Superman is attempting to fit in more with society by complying with human expectations, first by turning himself in as the alien General Zod is looking for, then as a “typical” guy joining the workforce. Emotionally, the theme evokes feelings of heroism, security, and hope, each of which can be attributed to an aspect of the music itself. The sense of heroism is evident in its prominent use of a rising perfect fifth. Its feeling of security derives from the use of a tonic pedal point, or the repetition of the key note of the scale (the tonic) throughout the theme, which anchors the theme to familiar musical ground even when the chords become strange and chromatic (at the entry of the synthesized voices at 1:46). And a sense of hope arises largely from the scoring of the theme’s melody for French horns, trombones, and cellos, which combine to give a plaintive yet strong sound when played softly as they are here. At these moments, Superman becomes introspective as he searches for a way to satisfy both his own desires and those of society. This emotional quality is created not only by the slow, contemplative rhythm of the theme, but also by its scoring for piano, which lends an intimacy to the sound, as though we are privy to the character’s tender, private thoughts. The theme’s most distinctive feature is its use of what’s called the Phrygian mode, a kind of scale that’s like a minor scale but with a lowered second scale step—this is the characteristic sound of the Phrygian mode, and it gives the theme a dark, sinister character. More subtly, the two even share a common metre, with beats arranged into four groups of three (here, notated as 12/8 in Zimmer’s theme, which was transcribed by ear). Even though the two themes have a very different feel, these striking relationships create a connection between them that one could rightly call homage. In short, there seems to be no doubt that, consciously or subconsciously, the Williams March had an influence on the creation of the Zimmer’s Heroic theme. 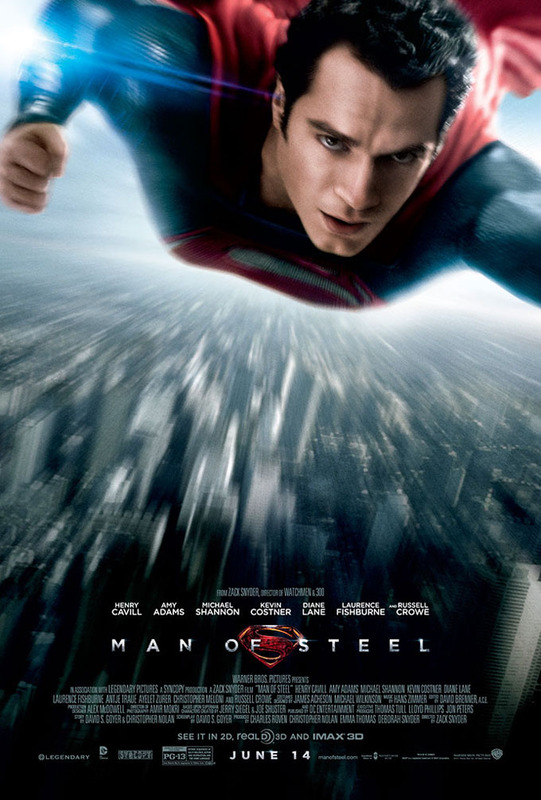 Many of the themes in Hans Zimmer’s score for Man of Steel are given dual meanings, generally one positive, the other negative, a distinction made clear by the instrumentation and rhythmic setting of the theme. In addition, the associations that the themes have are rather loose in that they signify the same character (or set of characters) in similar situations rather than simply signifying the character in the manner of traditional leitmotifs. While themes in films are usually altered in some way to reflect the changing emotions of the story, the two forms of each of the themes in Man of Steel are employed in such contrasting ways that they actually signify something different, at least on the surface. On a deeper level, the dualistic themes represent two aspects of the same idea, like two sides of the same coin. This is quite a different approach to film scoring, especially for a blockbuster such as this, but then, this is quite a different Superman film. Many of the links have been pulled. Wish I could take a listen. I just tried them and they work for me. It must be something related to the country one is in. If you give me a link to a YouTube video of Man of Steel audio that works for you, I can try inserting those instead. It was (as always) an inspiring post. First I thought the score is that bad, reviews said. After this post I think different, especially of the dualistic Theme(s). I hope your blog will exist as long as possible! Thanks, Malte. I myself was surprised at how complex the use of the themes is. It was very different from Zimmer’s Dark Knight scores, but it still worked quite well. I hope to keep the blog going too. It’s been eight months so far! good analysis but why didn’t you talk about the last track on the album? It’s the superman theme in it’s fullest form. @Dave: It’s really the brevity of these analyses that forces some themes to be left out. The one on the last track is the theme heard in the first flight sequence (combined with a brassy theme that scene didn’t have). I tried to keep the analysis on more pervasive themes in the film. That’s all, really. About the Introspective theme, you could call it “Clark Kent”, but I think that would leave out something of the meaning of that theme. The funny thing is, these themes aren’t really leitmotifs in the traditional sense. So calling it “Clark Kent” would make it seem like it’s heard whenever that character is onscreen, something like, say, Darth Vader’s theme in the Star Wars movies. To me, the theme is more of a signal that Superman / Kal-El / Clark Kent (whichever you want to call him) is having trouble fitting in with human society and forces him to ponder things philosophically. Hence, the introspective name. Also, “Superman Introspective” highlights the dual nature of the theme with the Heroic version more than, say, “Clark Kent Introspective” would (though that’s just as accurate). Thank you, Kevin! I’ll take a listen to Moriarty’s theme – haven’t yet seen Game of Shadows, but would like to soon. Inception’s a score that certainly deserves more attention, but I think it’s overshadowed by Zimmer’s Dark Knight music, being another collaboration with Christopher Nolan. “Time” is the cue everyone always raves about. Maybe I’ll do a post on that score sometime. just a hint, for moriaty’s theme Zimmer used a piano phrase from schubert’s Die Forelle and changed it to a minor key in a much slower speed, then started to develop the whole theme, which is awesome! Indeed Inception is one of the best score from Zimmer, yet while “time” is a stunning piece, tracks with similar melody can be heard in some other Zimmer’s score like “The Thin Red Line”. But what I appreciate is how he manipulated these few simple cords according to concepts of dream and time. And of course the idea of deconstructing Piaff’s song into an iconic brass blast is phenomenal as well. And I will be expecting your post too! I found the stuff about Jor-El’s theme particularly intriguing. When I first heard it, I thought it was just Superman’s theme in one of many forms, but you’re right: it definitely denotes Jor-El as well. Thank you for a good read. Also, have you thought of analyzing the themes in Zimmer’s Lone Ranger score? I have heard that the score for Lone Ranger is a surprisingly tuneful one for Zimmer. I haven’t yet seen the film myself, but have heard the last track with the Rossini mix. I’ll have to hear it with the film because I’m not sure what to make of it on its own. Thank you for all your hard work as my students will love your site for studying film music. Many thanks for your enthusiasm, Samuel. It’s much appreciated. Wow, what a brilliant write-up. As always, there is so much more to Hans’ work than what you pick up on the first listen. I think Man of Steel is a terrific and well-thought-out soundtrack, but you actually put into words WHY I like it so much. Great job! Interesting and informative! Please keep writing your posts, your assessments are amazing. Thanks, I. Shafeeg. And greetings to you too! Is the Man Of Steel soundtrack cd presented in film order?